We were born in the dirt, riding and racing off-road is what started it all. We know how devastating it can be to see your bike sit in the garage. If your dirt bike needs some work bring it in to us and we’ll ready your ride for your next adventure. Bring us your sport bike, cruiser, touring bike, scooters… if it has 2 wheels (or 3 wheels) and it goes down the pavement we can get it tuned up or repaired for you. From a simple tire change to a long overdue full service we have the capabilities to get your ride back on the road. Jetski service requires a specific set of equipment and experience and here at AXXIS we have both. We can even store your watercraft during the off-season, making sure that once summer comes around it will be ready to rip. 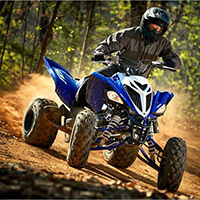 Whether you own a kid’s sport quad or a big 4-WD utility quad bring it in and we’ll get it fixed up for you. Switching those off-road tires out to paddle to head out to the dunes this weekend? We can throw ’em on our tire changer and swap them out for you. That’s obviously just one of the many jobs we do here at AXXIS Motorsports. Side-by-Side’s see more wear and tear than most dirt vehicles. They also have a seemingly unlimited amount of modifications and customization accessories available these days. We can handle all of your needs. Service, repair, and installs are our specialty. Came in for my jetski. One of just a handful of providers that service and maintain jetskis, and these guys are definitely pros. I've been to other shops that would overcharge you for services, but this place is very neighbor freindly. Humble, honest, and professional. I had an interesting situation as I live out of state and needed my bike ready for my upcoming trip. Without the guys at Axxis Motorsports my trip would not have been possible.